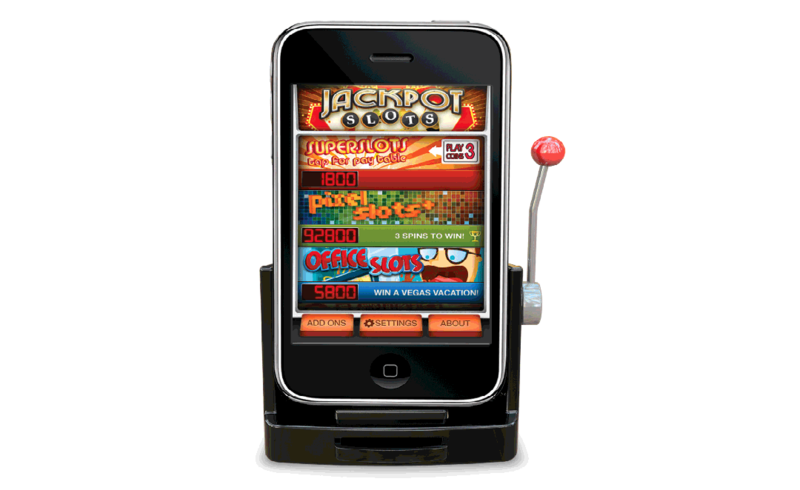 Jackpot Slots charge and sync dock is the most realistic gaming experience your iPhone or iPod touch. Transform your 30-pin iPhone or iPod touch into a into a casino-style slot machine. I connected to the dock and it tells me this device is not made to work with iPhone, what is wrong? Chances are you do not have a solid connection to the dock. Remove your iPhone and reconnect it to the dock. You can check the connection status in the application by viewing the SETTINGS screen and looking for a GREEN status bar indicating your are properly connected. if the status bar is RED, try reconnecting the device to the dock. When in doubt, try removing your case or protector and see if the dock is working properly. After one pull of the level, I cannot start the next spin, what up? To eject your device from the dock, you pull the handle all the way forward. If you pull the handle too far forward, you will disconnect your device from the dock, preventing any further communicaitons. To activate a spin, just pull the handle forward until the wheels begin to spin. Do I need an adapter to use the dock with my iPod touch 4G? Jackpot Slots is compatible with each model of iPod touch. Certain early production units of the 4G iPod touch dock had a plastic manufacturing issue (that was corrected) that made them a tight fit on many accessories. We verify fit and function with all compatible models of iPhone and iPod and have not experienced a problem with the 4G iPod touch. Will Jackpot Slots work with my bumper case? The dock uses a pop up 30 pin connector that is compatible with most cases. If you are using a case on your device, make sure you firmly press down to ensure a good connection with the dock. To eject, pull the handle all the way forward and the dock will help to separate your device from the dock. How do I get the Jackpot Slots application? You can download Jackpot Slots from the iTunes App Store either through iTunes or right from your iPhone or iPod using the integrated App Store utility. You can run the application without the dock and see how it works, but to really play the slot machines you will need to have the hardware for the complete experience. Can I use my Jackpot Slots dock without an external charger? Sure, the functions of the dock needed for the Slot Machine application are provided by the iPhone or iPod touch. The external charger is only needed to charge your device while it is docked. So Jackpot Slots will work on the road just fine. Will the dock drain the battery of my iPhone or iPod touch? While the dock is powered via the 30 pin connector of your device, it uses ultra-low power circuitry which consumes no significant power from your battery. In fact, it could be powered by a external battery made from a potato because it requires so little power. As one example compared to the normal functions of your device, it uses less than one thousandth the power of the just the display backlight. I just can't get the dock to work with my iPhone or iPod, what can I do? On certain situations, the iPhone or iPod might refuse to work with external accessories. This state rarely occurs in normal use, but if this occurs, this state can easily be cleared and operations returned to normal by simply resetting your iPhone or iPod. Can I listen to my music while playing Jackpot Slots? Definitely, all you have to do is turn your music on, go to the settings button located on the bottom of the Jackpot Slots home screen, and turn the background sound effects down or off. If the background sound effects aren't bugging you, it can be left on and your music will automatically play over the background sound effects. Your music can be listened to using the iPhone speakers or your headphones. The Jackpot Slots app mentions a contest but I cannot sync or register. Why? New Potato is no longer running promotional contests for Jackpot slots. You can disregard these prompts in the application. We may resume these promotions at a future date, but there is no currently scheduled date to do so.